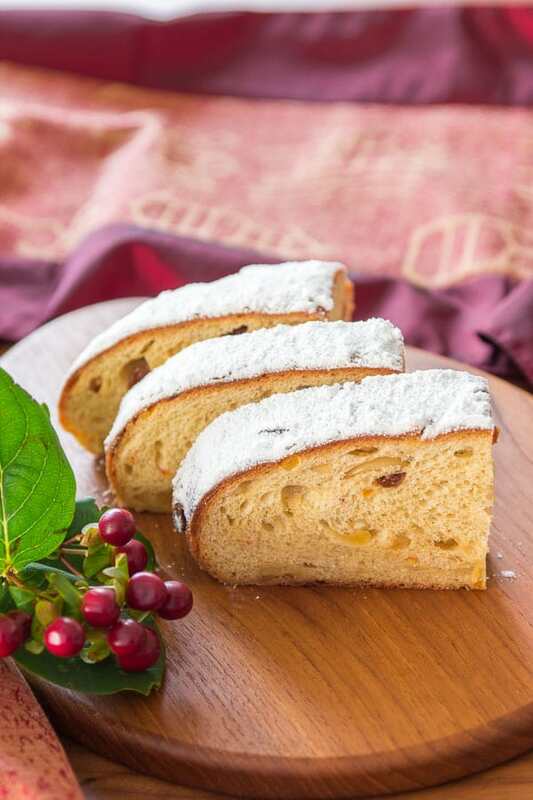 This Christmas Bread combines all the best parts of Stollen, Panettone, and Fruitcake for a buttery brioche studded with vanilla rum spiced fruit. These days, the holidays and cookie making may go hand-in-hand, but the holiday tradition of baking tasty treats predates chocolate crinkles and jam thumbprint cookies by hundreds of years. 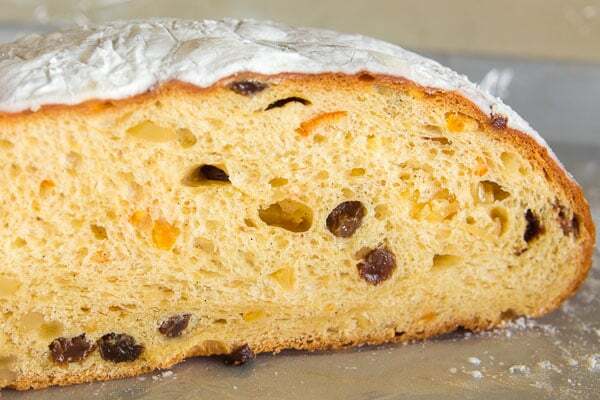 One classic confection found in various forms across Europe is made with dried fruit and nuts mixed into a bread or cake. The British (and their former colonies) call it Fruitcake, the Germans: Stollen, the Italians: Panettone, and the French: Gâteau des Rois. While fruitcake in the US has gotten a reputation akin to that gaudy sweater your aunt gives you every year, it’s not without its merits. How many cakes do you know of that can get you buzzed? I know I probably sound defensive, but that’s because fruitcake and I have a history. My mom used to run a mail order business (that’s where you order things out of a paper catalog for those of you that are under 30), and one of her regulars would send us a pair of fruitcakes every year for Christmas. A loaf of jewel-like candied fruit, held together by just the slightest amount of buttery rum drenched batter. They were magical, and one of the culinary highlights of the season. 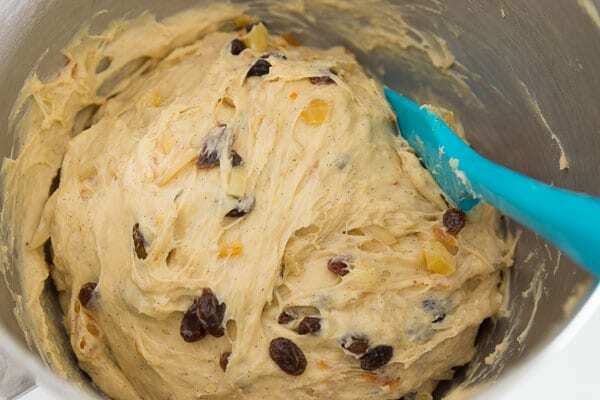 As delicious as they are, making Stollen isn’t a small undertaking; a fact I wasn’t aware of until I saw a loaf at a local bakery the size of a TV remote for $30. At first I thought they’d misplaced a zero, but after checking a few other bakeries nearby, the prices ranged from $25 all the way up to $40! As much as I love Stollen, I wasn’t about to spend 3 days worth of grocery money on a loaf of bread. After getting home, and looking up a few recipes, it became pretty clear why they are so expensive. With a day of soaking, a day of baking, and two days of resting, each loaf takes about 4 days to make. Still, my brief encounter had thoughts of tender dried fruit, and a rich sugar entombed bread dancing about my head. Knowing I don’t have the baking chops (or patience) to pull off a real Stollen, I hatched a plan to come up with something new instead. 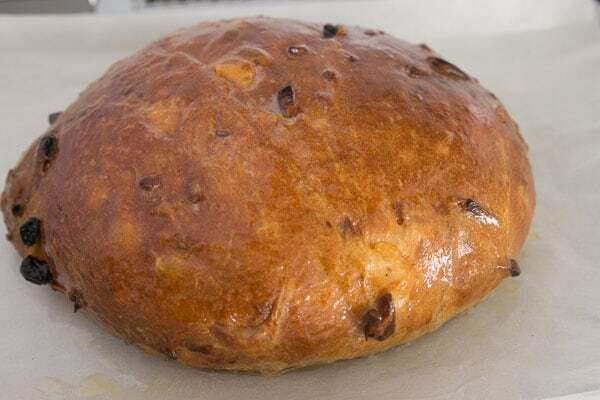 Born from my cheapness and laziness, my Christmas bread takes the best parts of Fruitcake, Panettone and Stollen, merging them into a light buttery bread redolent of vanilla and citrus peel. I soak the fruits and nuts in rum spiked with a whole Tahitian vanilla bean and fresh ground nutmeg; this not only spices the fruit, it flavors the brioche dough as the fruit gets kneaded in. A few generous coats of butter, as it emerges from the oven, ensures a nice thick blanket of powdered sugar; it also keeps the bread tender and moist far longer than it will last given the seconds and thirds everyone is bound to reach for. For the fruit, I used a combination of candied blood orange and yuzu peel, which was a marvelous combination, but regular candied orange and lemon peel would work fine. I’m not a huge fan of ginger in sweet things, which is why I didn’t use a ton, but if you like ginger, feel free to increase the amount as it was barely perceptible in the finished bread. Lastly, as with any of my recipes, this is just a guideline. Feel free to experiment with other dried fruits such as cherries, mangoes, or pineapples. I also love adding cacao nibs to the soaking fruit in place of the almonds. The bread is amazing warm, but it gets even better as the butter and sugar have a chance to seep into the bread over the next week. Even if you do decide to eat it fresh, I highly recommend saving a bit to see how the flavor and texture changes. 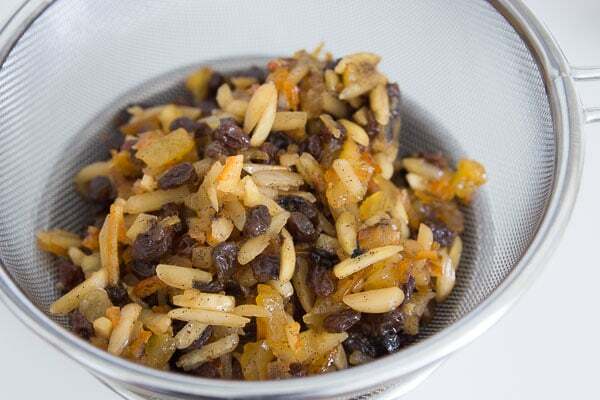 Put the raisins, slivered almonds, dried apples, citrus peel, ginger, vanilla beans, nutmeg, and rum into a bowl and mix to combine. Let the fruits and nuts soak overnight, stirring a few times to ensure every piece gets its turn in the rum bath. You can speed this up by sealing everything in a vacuum pouch if you happen to have a chamber vacuum. In a medium glass bowl, microwave the milk until it's warm to the touch (110 degrees F). Whisk the yeast and honey into the milk until dissolved and then whisk in about a third of the flour. Cover and let this rest in a warm place for 1 hour to give the yeast a head start. 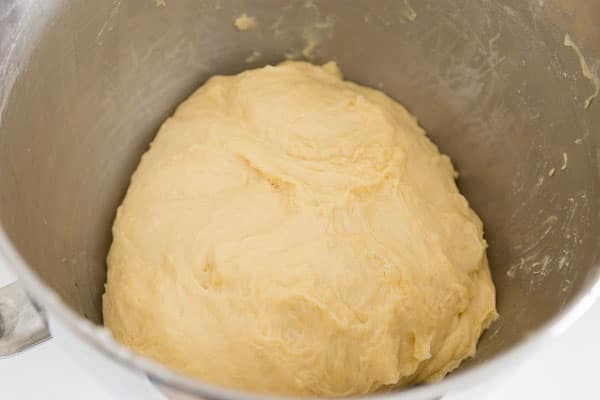 While the yeast mixture is resting, take the butter and eggs out of the refrigerator so they can come up to room temperature. Whisk the eggs until uniform and frothy. Check the fruit and if there is any liquid remaining at the bottom, drain the fruit in a strainer (the spiced rum is awesome with some soda water or in apple cider). 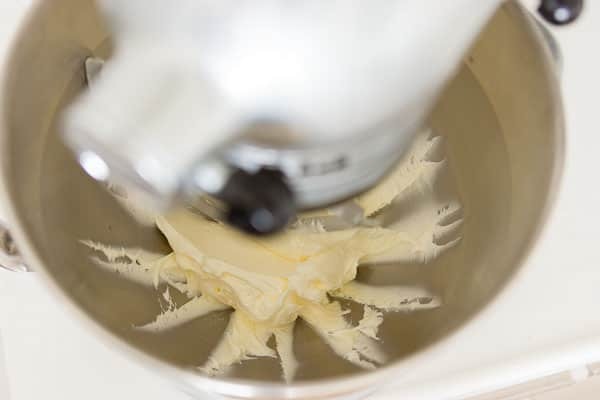 Once the yeast mixture is done resting, put the butter and salt in the bowl of a mixer fitted with the paddle attachment and cream until light and fluffy. With the mixer running at medium speed, pour the eggs into the mixer in a slow steady stream. 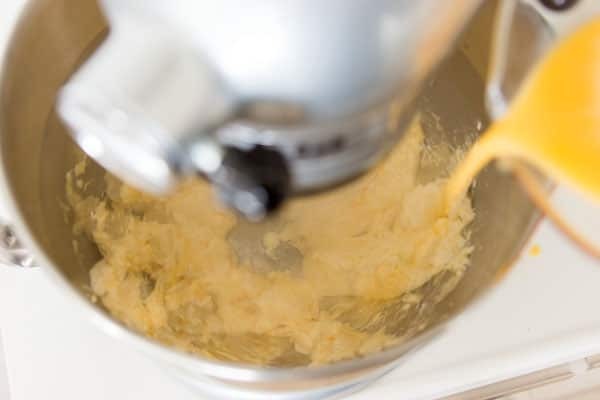 If your butter and eggs weren't up to room temperature, or you add the eggs in too quickly, the mixture will curdle, but even if it does don't worry about it as it will be fine after you mix the flour in.Stop the mixer and add the remaining flour and yeast mixture to the butter and eggs and mix until combined into a dough. 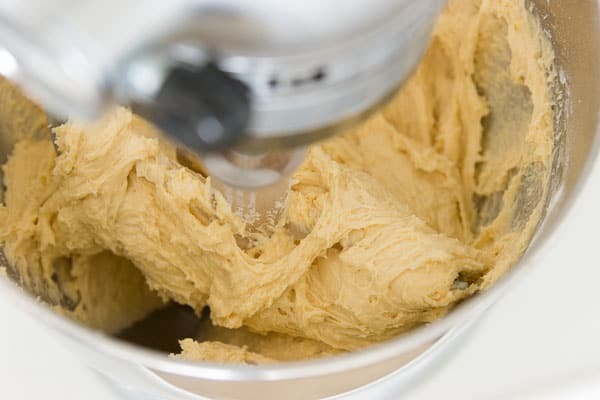 Switch to the dough hook and knead until the dough is smooth and elastic (5-7 minutes). Add the fruits and nuts and knead in by hand. 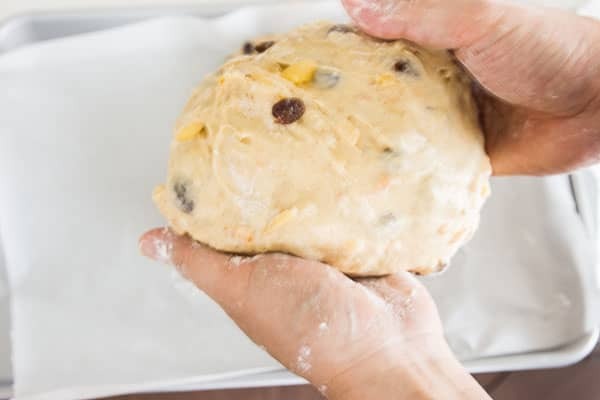 Dust your hands with flour and shape each half into an oval by stretching the top surface with your thumbs and using your other four fingers to tuck the stretched parts into the bottom of the loaf. After doing this a number of times, you should have a relatively smooth (except for all the fruit poking out) top surface. 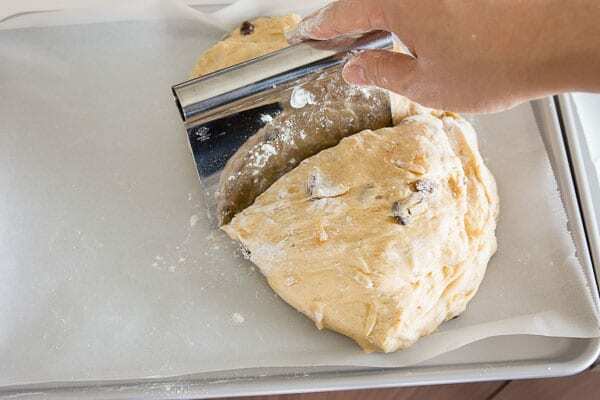 Set the loaf in the middle of parchment lined baking sheet and repeat with the other piece of dough. Cover each loaf with a damp clean dish towel and let it rise in a warm place for 1 hour. About 10 minutes before the bread is done rising, preheat the oven to 350 degrees F (180 C). Bake until a deep golden brown color (about 40-45 minutes). As soon as the loaf comes out of the oven, put it in a large bowl, right side up and then drizzle half the butter all over the top surface of the bread. Flip the loaf over and then drizzle the other half on onto the bottom surface of the bread. Transfer the loaf back to the sheetpan. Pour the butter pooled at the bottom of the bowl back into the vessel that originally heald the melted butter and then repeat with the other loaf of bread. Continue repeating, alternating loaves, until there is no butter left. Let the butter soak into the bread, so that the surface of the loaves is no longer shiny, and then dust the tops of the bread with a generous amount of powdered sugar. I use about 1/4 cup per loaf. 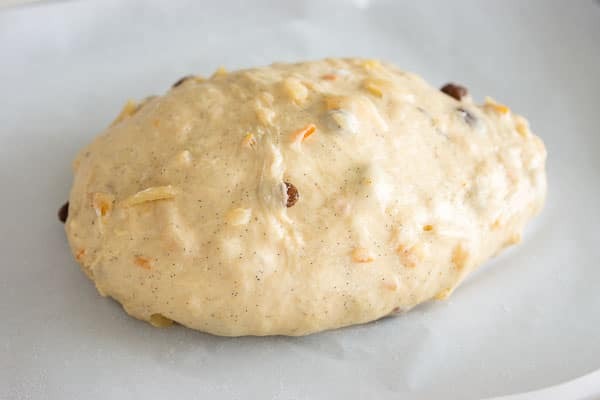 Let the Stollen cool completely and then wrap it well with plastic wrap and then set it a cool dark place for at least 1 week for the butter to flavors to meld. 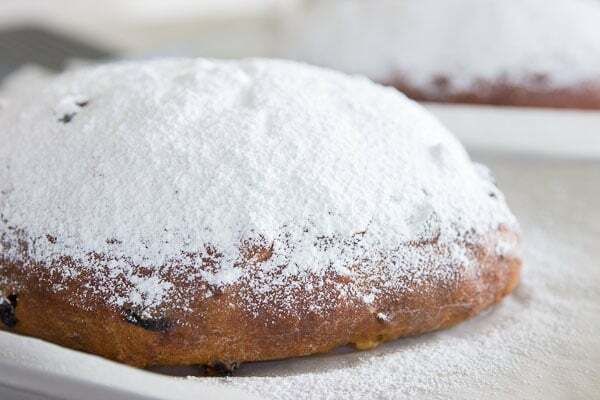 You'll probably want to dust some more powdered sugar on top before serving. We adore fruitcake in this house, but now that my daughter is gluten free for health reasons, we will not be having it in the house. Your recipe looks delicious. This is a wonderful idea! I started making stollen a few years ago and you’re right, it is quite a process. I make a quadruple batch over one long day and I feel like mine finally tastes like my Oma’s. Your Christmas bread looks delicious! I just made your fruitcake. It came out wonderfully! It looks appertising and it tastes good. Thank you for sharing the recipe. Hi Jaime, I’m so glad to hear you enjoyed this! It gets better for a few days when sealed in a air-tight container.